The warden of RSPB Brading Marshes says that hearing a booming bittern on a wetland reserve is “like receiving a Michelin star as a restaurant”. Britain’s loudest bird, the bittern, had never been heard booming on the Isle of Wight before this spring, when its distinctive mating call was heard a RSPB Brading Marshes. As the volume grew so did the excitement, as the presence of one of the UK’s rarest birds is both an indicator that the species is continuing to recover and that RSPB’s recently restored wetland is flourishing. For conservationists, attracting breeding bitterns is widely considered one of the best indicators of successful wetland management. Bitterns are highly secretive wetland birds and live most of their time within dense stands of reed, making them very difficult to survey. However, scientists count bitterns by listening for the male’s foghorn-like booming call, an indicator that a male is searching for a mate. The UK bittern population had fallen to just 11 booming males in 1997, but thanks to intensive conservation efforts the population is now recovering. However, there are still less than 200 bitterns at fewer than 75 UK sites, making the discovery of male trying to breed on the Isle of Wight even more remarkable as the population grows. Expert habitat management at RSPB Brading Marshes reserve has already seen three new wetland species; marsh harrier, little egret and great crested grebe, successfully breed on the Isle of Wight. 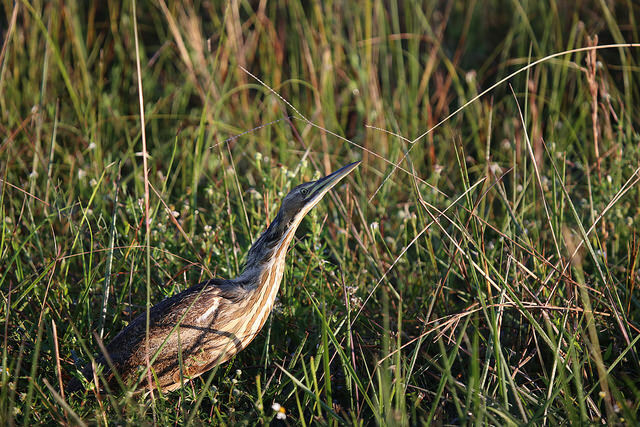 The RSPB hopes that this booming bittern’s mating call will be successful in attracting a female, and that they too will successfully breed on the reserve; becoming yet another first for the island. “Hearing a booming bittern on a wetland reserve is like receiving a Michelin star as a restaurant; it’s one of the highest marks of success we could hope for. Bitterns have very selective habitat needs, and to attract them you need a truly thriving ecosystem. Staff at the reserve will be monitoring the bird over the coming week. 2 Comments on "LISTEN: Booming Bitterns heard on the Isle of Wight for first time ever"
That headline isn’t quite correct, I’ve heard a Bittern in the vicinity of Afton Marsh and even had one in my garden.